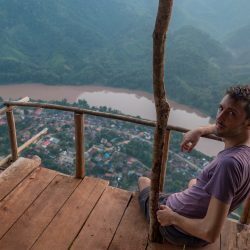 I had no plans to travel to Istanbul this year, but that quickly changed when I noticed a special promotion on the Turkish Airlines website when booking my flight to Tbilisi, Georgia. 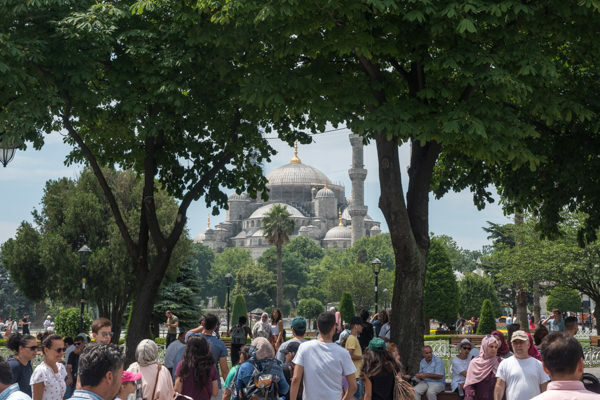 Lured by the promise of a free hotel — so long as I stayed in Istanbul for at least 20 hours — I turned what would be a 5-hour transfer at Istanbul’s airport into a 36-hour layover. I had been to Turkey only once before. It was around 15 years ago when I was college age and on a cheap all-inclusive resort holiday to the southern Turkish coast with some friends. But ever since, even though there are many reasons to love Turkey, I’d mostly forgotten about it as a potential travel destination. Maybe that’s because that trip back then was a lot of fun but maybe not the most sophisticated. We spent most of our time lounging by the swimming pool or drinking free raki at night. Apart from an afternoon excursion to some Roman ruins, I didn’t see much of Turkey beyond the confines of a walled-in resort filled with Russian tourists. 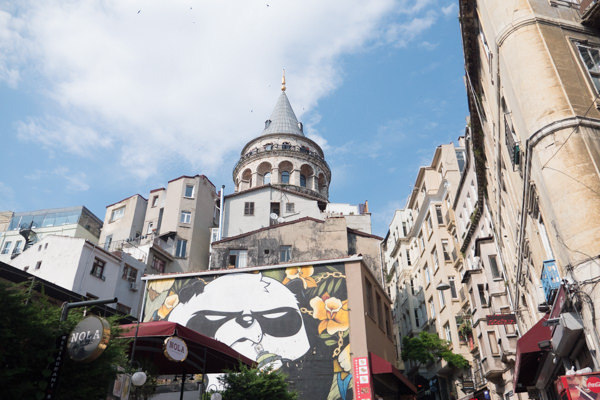 Anyway, my layover in Istanbul finally got me a fresh albeit brief look at Turkey — and this time, I was able to soak up much more of the culture and local vibe. 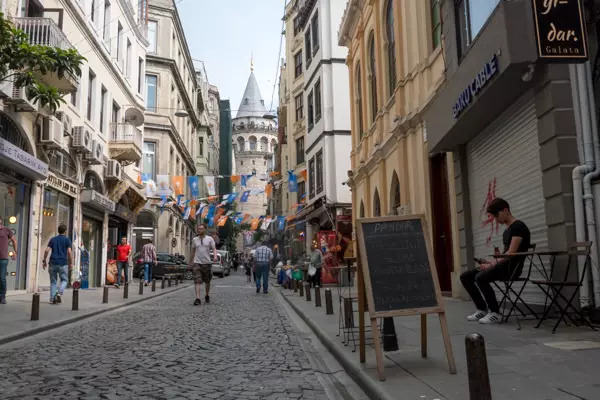 Similar to other stopover deals offered by countries like Iceland and Portugal, Turkish Airlines will comp you a free hotel if you connect via Istanbul and decide to stay in the city. Obviously, they hope this will promote Turkey as a tourist destination. The offer is open to any economy or business class customers. Turkish Airlines is a pretty solid airline that I’ve enjoyed flying with several times. 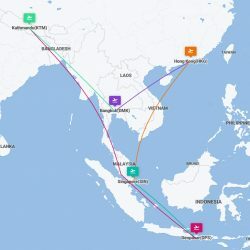 They operate a good hub that connects well to Africa, Central Asia and beyond; I once also flew with them from London to Bangkok at a truly bargain price. 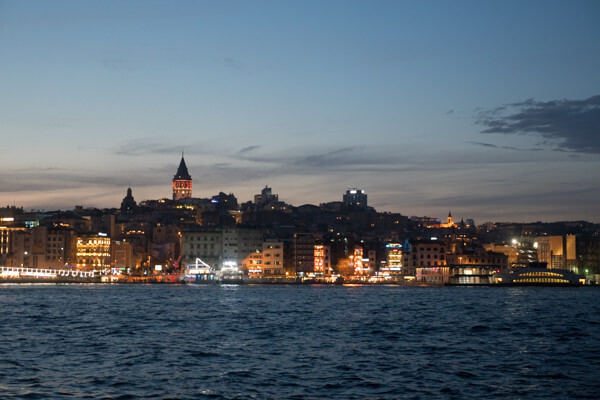 To qualify for the free accommodation you need to stay in Istanbul for at least 20 hours. 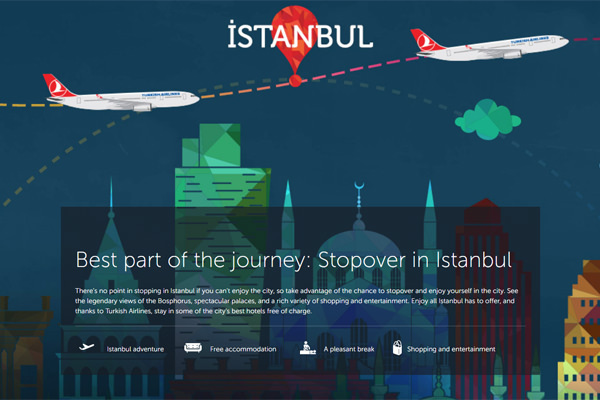 You’ll need to put a deliberate stopover in your flight itinerary, which you can do by using the multi-stop flight search on the Turkish Airlines website. Enter both legs of your flight itinerary separately, and then add an extra day in between the two flights. The airline website has details for how to request the voucher. I was given a choice of four hotels, of which the Clarion Golden Horn was easily the fanciest one (its standard rooms normally go for 120 EUR a night). I was tempting but it was well out of town, so I went with a smaller hotel in the historical center, the Orka Royal. Was it worth it? Eh, maybe. I must confess I’m not a fan of hotels; the service is always so impersonal, the WiFi is always crappy, and the rooms are often so characterless. On my second night, I stayed in a 10 EUR a night hostel. 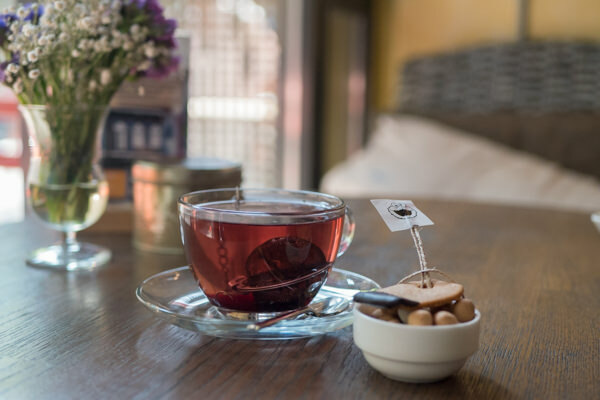 It may not have had AC, a rooftop pool or a gym, but it did have friendly service and a lovely atmosphere — not to mention a chilled out bar where I could listen to stories from some dudes who’d hitchhiked to Istanbul from Ukraine. That’s more my kind of jam. But hey, that free hotel got me into Istanbul I guess! Like a true cheap Dutchman, I’m easily persuaded by a freebie, and I clearly wouldn’t want to look a gift horse in the mouth. I’m happy to say that my Istanbul layover was fantastic, and that the city is highly worth checking out even on just a brief visit. 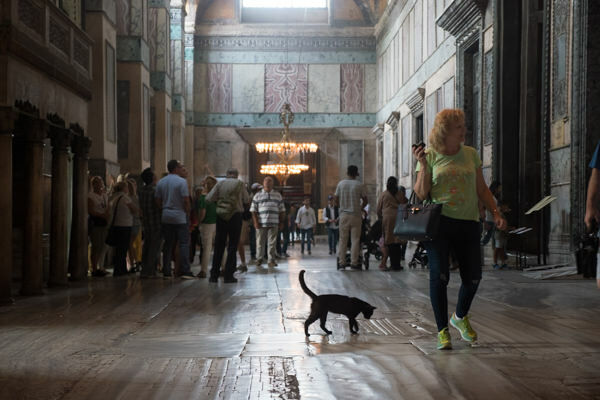 I’d hate to use such a cliché, but Istanbul genuinely felt to me like East meets West. Located right at the fault line between two geographical and cultural spheres, some aspects reminded me utterly of Asia while others are totally European. 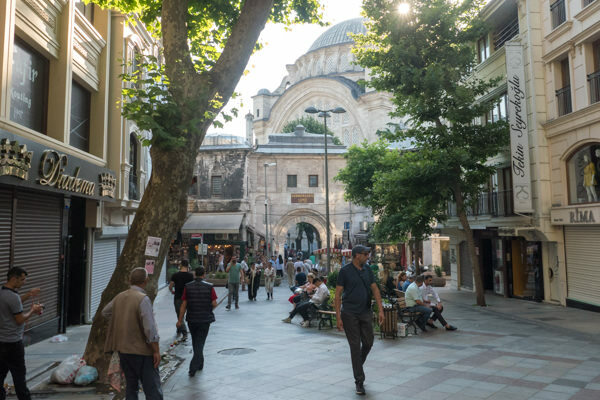 It’s a fascinating city with a deep history, serving as the capital of the Byzantine Empire and once a key city in the Ottoman Empire as well. 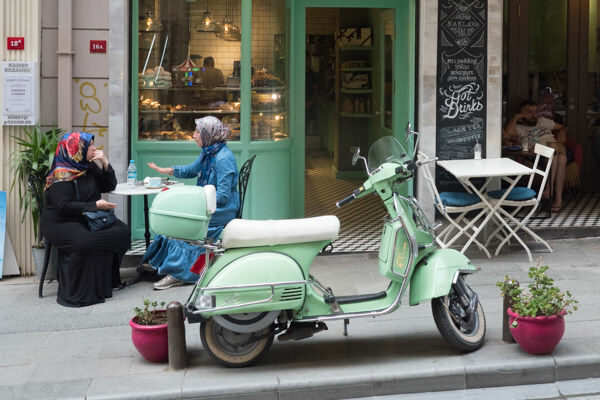 My layover in Istanbul no doubt covered a few bog-standard sights and places, but each of these were delightful and not to be missed. 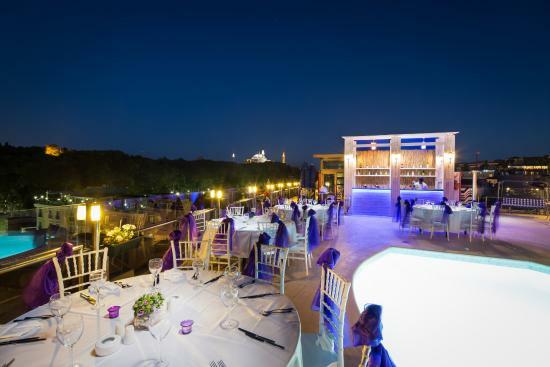 Should you also find yourself in Istanbul on a brief visit, I can easily recommend the following highlights. 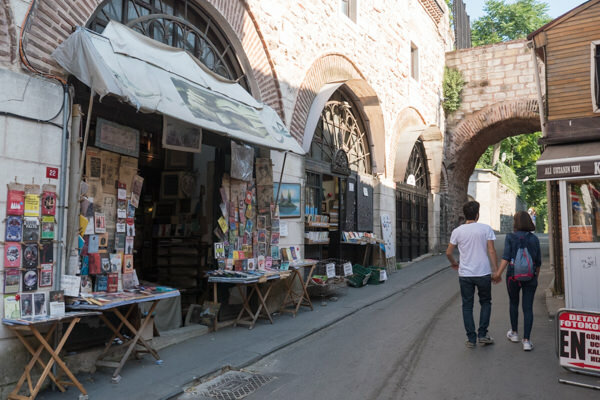 After arriving in the city in the evening I immediately wandered along the Bosphorus riverside promenade, and then dove into some neighborhoods in the historical center. 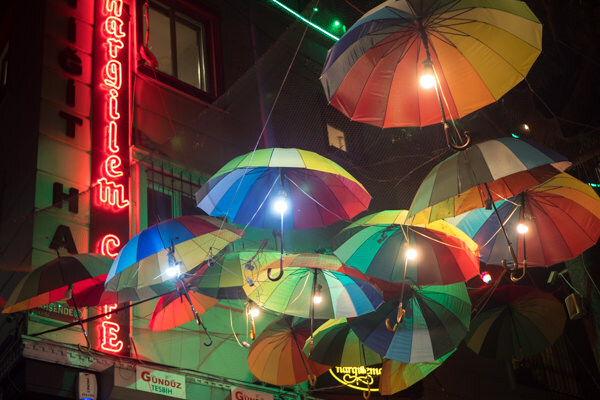 I came upon an alley covered in colored umbrellas (this seems to be the cool thing these days?) which led up to some stairs to a cluster of rooftop bars. 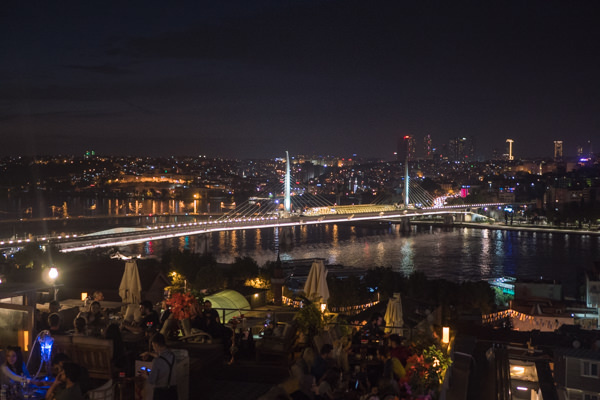 I sat myself down on one of the roofs of the Bab-ı Âli Kahvesi cafe [map]. 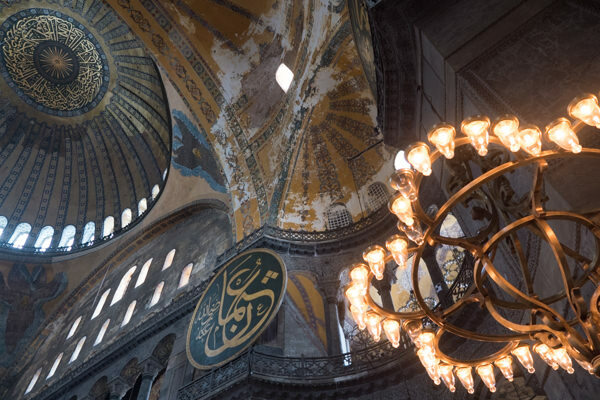 This grand building served both as a cathedral and a mosque throughout the ages, going back as far as the times of the Byzantine Empire. 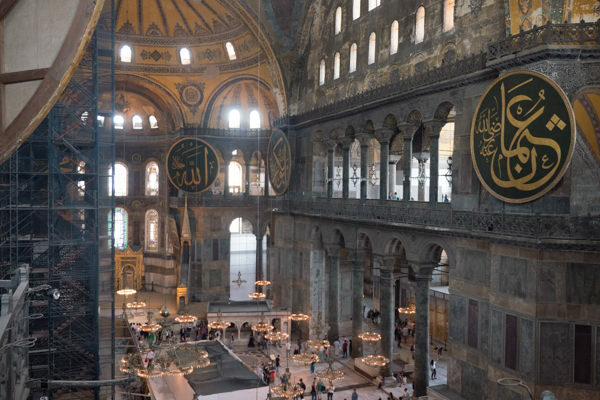 For nearly a thousand years, the Hagia Sophia was in fact the largest cathedral in the entire world. Once you step inside, it’s immediately clear that it was surely meant not just to inspire faith in God but surely also to show off the power of whatever empire held it at the time. It’s a bit of an obligatory stop in Istanbul, so I figured I should tick this off first thing in the morning. The structure is hugely impressive in its own right, though I think even better appreciated with a knowledgeable guide. 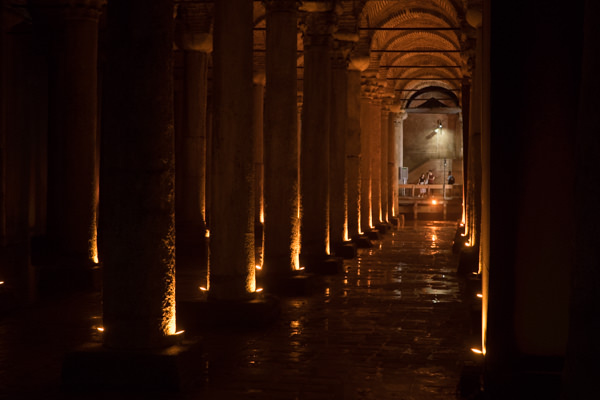 This ancient underground reservoir and filtration system once provided water to the Great Palace of Constantinople and other nearby buildings. It’s a (literally) cool and mysterious place, featuring several Medusa head columns and other interesting details. I loved going down the stairs into this little underground world and instantly transporting myself to Roman times. As you may, Istanbul was once known as Constantinople and served as the capital of the Byzantine Empire (which was the eastern half of the Roman Empire when it split into two). The city is known sometimes as the “second Rome”, and you can definitely see this history here and in other locations around the old city. Having covered some of the ancient city and strolled through its parks, by mid-day I felt compelled to cross the Bosphorus river to the other side. I followed the Galata Bridge which, somewhat oddly, has lots of restaurants on its lower level. 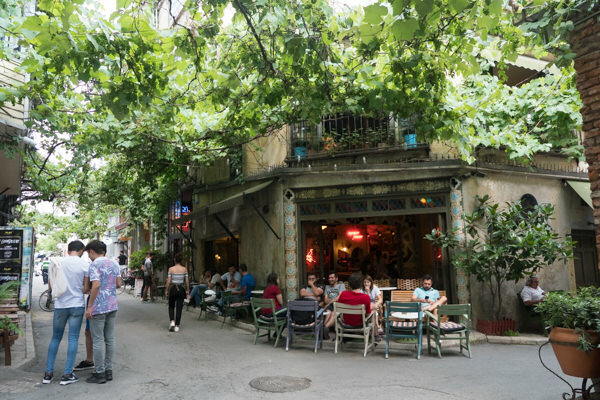 I then stumbled upon Karaköy [map], a riverside neighborhood filled with funky cafes, ateliers, street art, and little alleys covered with vine roofs. It’s a very browsey part of town that’s clearly a favorite among many locals. I recommend sitting down here for a nice brunch or lunch, maybe having some fine Turkish tea or a shisha, and just watching the world go by. It’s a trendy part of town but seemed rather unfrequented by tourists, making it a fun area to catch some local atmosphere. One of my tried-and-tested ways to explore a city is simply to walk towards whatever next landmark I can see off in the distance. On top of a hill I spotted a Romanesque style tower and thought I might as well set it as my goal. 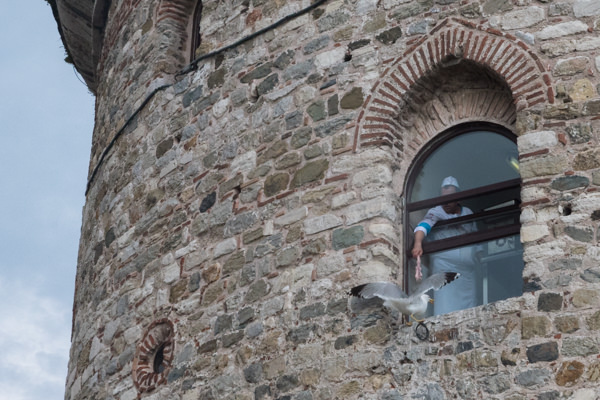 It turned out to be Galata Tower. A quick look on Wikipedia informed me this was in fact built by the Genoans in the 14th century. The republic of Genoa (the northwestern bit of Italy) was once a trading nation that rivaled Venice in its reach and influence, and they built numerous trading posts and colonies around the Mediterranean and Black Sea. Galata Tower was the centerpiece of their Constantinople colony. There was a huge queue to go up the tower which I couldn’t be bothered to deal with. 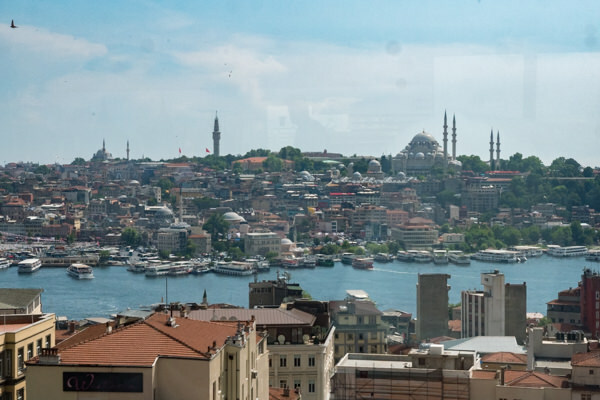 But looking up, I spotted a nice rooftop terrace inside the Anemon Galata Hotel [map], from where I could get panoramic views of the tower as well as the Bosphorus river below. 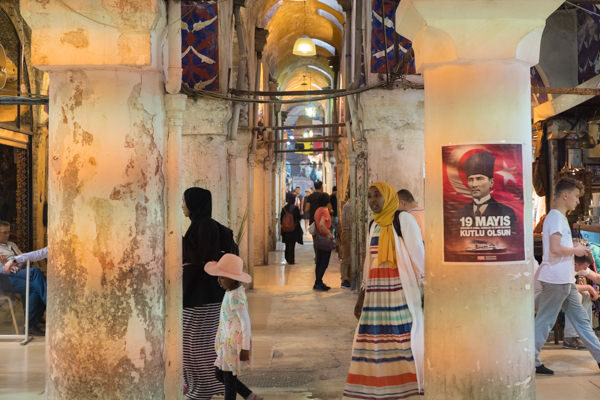 As evening approached, I topped things off with a visit to the Grand Bazaar, which is one of the oldest covered markets and often regarded as one of the first shopping malls of the world. It once sat at a key node on the Silk Road, and to this day it’s filled with lantern shops, gold jewellers, silk clothing stores, and so on. It’s a fun area to stroll around in even if you’re not intent on buying. I was also relieved to find that the sellers here are in no way pushy or annoying (much unlike in Turkey’s coastal resorts or, say, in the souks of Morocco). 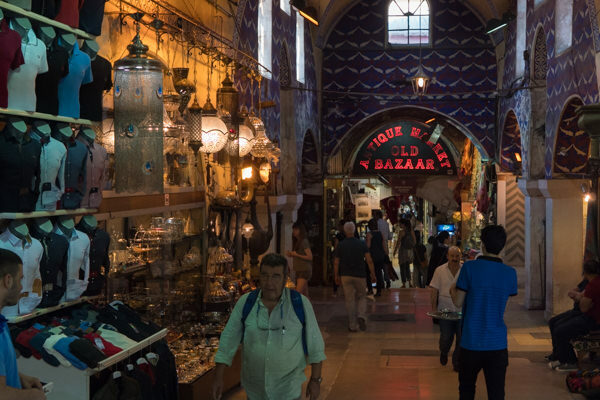 Still, you may wish to read this article on how to bargain like a pro at the Grand Bazaar. At the end of the day my feet were definitely tired from all that walking and I was craving a cold beer on a roof terrace. That said, the historical parts of Istanbul are extremely walkable, and you can pack a ton of sightseeing into a mere 24 hours. While I normally like to stay somewhere longer to get to know it inside out, I felt my layover in Istanbul was entirely worthwhile despite just seeing it in a flash. 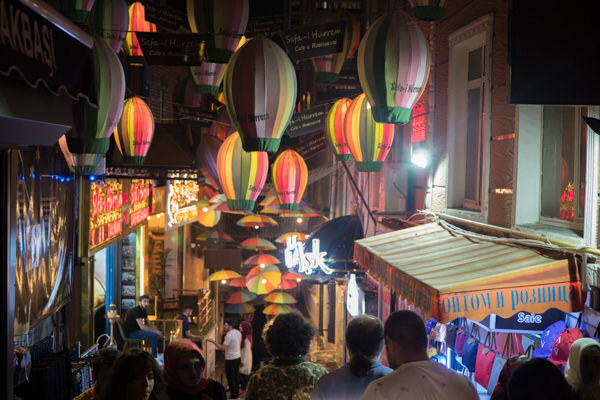 With its long history at the heart of multiple empires, Istanbul offers a wealth of historic and religious places to take in, and has a lovely street vibe to boot. Hello, I travelled with Turkish airlines in 2016 and had a 13 hour layover in Istanbul. During that trip, it is true I did receive a free hotel night and free airport shuttle to and from the hotel. 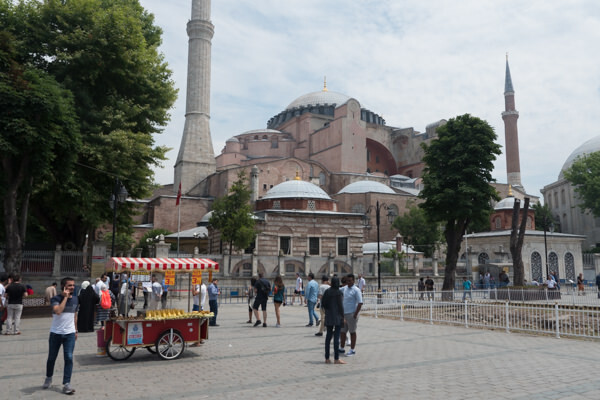 I was just there a week ago (October 2018) again with a 14 hour layover in Istanbul thinking I would get another free hotel night stay as it had happened before. 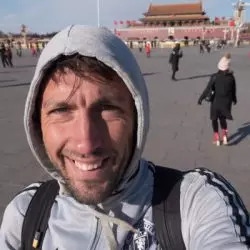 The man at the hotel desk was very rude, spoke very little English that I could not really understand and basically told me I did not qualify for a free hotel stay. He wasn’t able to give me a good explanation and I was not able to understand him. So I called Turkish Airlines customer service and the lady on the phone basically told me NO ONE is guaranteed a free hotel night no matter what the circumstances are and many times it is only based on availability. 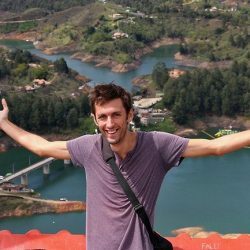 I ended up paying a $30 VISA to enter the country and $70 dollar hotel night with transportation I found randomly offered by a travel agency at the airport at 2am that night. It was very stressful and I don’t recommend anyone flying with Turkish Airlines if you don’t want to pay at least $100 or more for that unnecessary night in Istanbul. I just don’t want everyone to think they may be eligible for the free hotel night like I did. It is a coin toss! Good luck fellow travelers! That’s a good cautionary tale Evelyn. 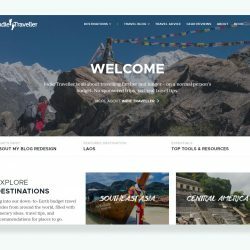 For what it’s worth, I prebooked my free hotel using the contact info here. I’m not sure what the situation is without this type of reservation. Wow. After sending that message privately I started browsing your latest posts and saw Istanbul! You won’t believe how excited I was as Turkey is also on top of my list. It’s always fascinated me with its East-West culture, but why I never went whilst in London I have no idea. Reading your article makes me want to go soon. (So many places to go, argh!) Lovely article. Thank you!